They say dyslexia is a gift but when Paul Richardson was a small boy it didn’t seem that way. He left school being unable to read and seriously wondering what path he was going to lead in life. Little did he imagine back then that his witty and satirical take on life would help him forge a career like no other - as an artist and sculptor whose talent and intelligence has an unerring ability to make people chuckle, smile and wonder. This summer he’s also on the brink of his biggest and most prestigious public art work to date building giant replica Monopoly pieces for the city of Waterford in Ireland. It was a contract that he won from bidders across the world - so over the next few months besides creating new works for a show at Aldeburgh Art Gallery and doing a number of private garden commissions, his work is really cut out. And, it’s not just that he’s got to figure out how to construct a five metre version of the Monopoly “battleship” but he needs to sort out transporting it from his tiny workshop in Middleton across the water to Ireland. Paul explained, “I’ll have to build it in pieces, we’ll have to use a low loader and take it on the ferry and assemble it there. The commission also includes making the board game’s new piece, The Cat, which is going to sit on top of the Battleship and a sculpture of Mr Monopoly too. Of course these pieces, under the watchful eye of Hasbro, owners of the Monopoly empire, have to be authentic replicas. However most of Paul’s work has a joyful quirkiness that anyone who has seen the Seagulls at Felixstowe Library, the Capel St Andrew village sign, the Angels of Music - at St Peter’s Church in Ipswich and Majors Convenience at Majors Corner in Ipswich, will instantly recognize. One of his most recent and beautiful works, tucked away on the Ravenswood estate also displays a thoughtfulness and a generous dose of lateral thinking. The award-winning sculpture of Pegasus, on the site of the old Ipswich Airport is called 52 Degrees North and has won awards for its beauty. A closer look shows the winged horse connecting Ipswich with Amsterdam, Berlin,Saskatoon in Canada and Pinsk in Belarus - places all on the same line of latitude. Of course there are also other more moveable sculptures that pop up from time to time in Suffolk at fairs, events and festivals - the Quiet Man with his suitcase and of course Lowestoft’s Dandy Boys. Paul says he has drawn all his life and believes he has given his art everything because of his dyslexia. “My father was a minister and I remember as a small child sitting in the back of church drawing pictures of people in the congregation. He went to college and did a graphics course and from there did a degree in fine art at Birmingham specialising in painting. 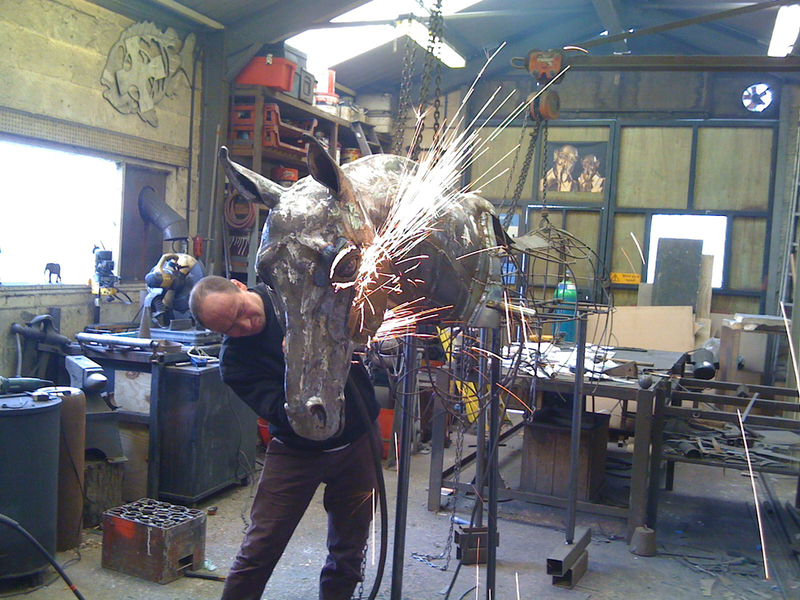 His route from a paintbrush to a welders torch though is entirely self-taught. “I started to use the old Birds Custard factory in Birmingham as a studio to paint. The building was clad in steel which was just hanging off the walls. Since then he constantly refines his techniques and if he doesn’t know how to do something he just works at it until he finds a solution. To begin with Paul started creating small figures and was then asked do a bridge archway in Birmingham which was the start of his public art career. Moving to Suffolk he’s subsequentially had commissions for from right across the country. The very witty Quick Step to Recovery depicting ballroom dancers got up in all their finery for example at Ipswich Hospital, is a local example. “I wanted to create something which was uplifting, surprising and would take people out of themselves. I went up and took a look round and thought people walking round the corridors seemed to do a sort of waltz. Then there’s the Dandy Boys, gorgeous creations inspired by the fishermen of the 60s at Lowestoft. Paul explained that men who worked on the boats were often at sea for many days and came ashore for just 48 hours. During that time they would want to spend their money and would dress to impress in colourful suits in red, green, line green and even tartan. Paul’s Dandy Boys have been something of a hit too - he’s made seven of them so far, one of the originals went to a collector in Paris but this year there was a commission for three - all from the same client. His Zombies were so popular - there used to be four of them - that they inspired not one but two art thefts. Paul explained he made one in chrome and others in green, pink and blue. Three were on display in the window of a Colchester Art Gallery which was at the time running a show with one of Britain’s top and famous contemporary modern artists. “One morning I got a call from the gallery owner saying there’d been a break in the night before and their front window had been smashed. “I immediately thought that art thieves had gone for the celebrated work in the show - but it seems no it was one my zombies that had gone. The remaining figure of the collection was the only one to survive but it’s safe and secure at home now.